Men who are looking for comfort without having to sacrifice style can find a range of elastic waist pants to meet their needs. 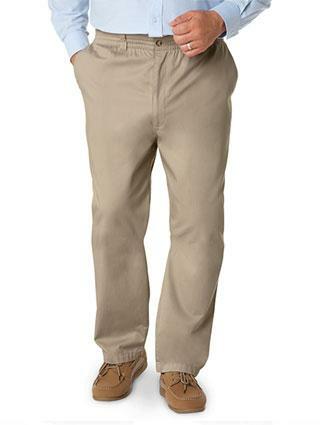 Elastic waist pants are available in a variety of colors and styles making them ideal for men of all ages and sizes. Scandia Woods Full-Elastic Cargo Pants: Priced from $30 to $36, these pants are done with a full elastic waist and feature six pockets as well as a button and zip fly and inside drawstring. They are made from a blend of cotton and polyester and come in colors such as moss, antique blue and buckskin. You can find these pants in sizes 30 to 48 with inseams of small to extra-large. SmartValue Full Elastic Pants: These pants are priced under $30 and are available in sizes medium to 2XL. The come in colors such as stone, khaki, navy and olive and are made from a cotton/polyester twill. These pants feature side pockets and a button and zipper closure. 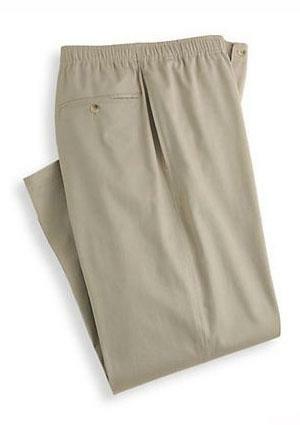 Elastic-Back Twills: These stylish pants are done with a pleated front and an elastic back waist. 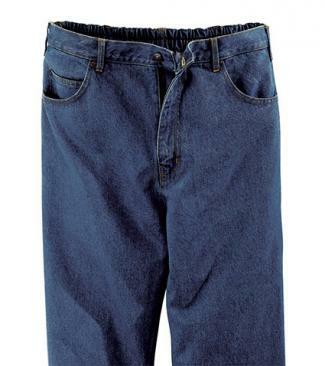 They are made from 100 percent cotton twill and are available in sizes 30 to 56 and medium to extra-large inseams. These twills come in colors such as charcoal, khaki, natural, navy and stonewash denim. Duke Side-Elastic Utility Jeans: These jeans feature side elastic insets at the waist as well as a zipper fly and belt loops. They have plenty of pockets and are priced under $30. You can find these pants in sizes 32 to 60 and in colors such as tan, indigo and grey. Duke Back-Elastic Jeans: These casual, five-pocket jeans are priced around $20 and are made from a blend of cotton and polyester. They have a back elastic waist and belt loops. They come in sizes 32 to 60 and in colors such as black heather, grey denim an several shades of blue. Harbor Bay Elastic-Waist Twill Pants: These pants come in sizes 1XL to 7XL and are priced around $55. They are done in a cotton twill and in colors such as black, navy, khaki and olive. These pants are available either with or without a cuff and in long or regular rise. Canyon Ridge Elastic-Waist Pants: Priced around $55, these pants are done in a wrinkle-resistant fabric made from a blend of cotton and polyester. They feature details such as side and back flap pockets and belt loops. They come in sizes 1XL to 7XL and in colors such as stone, black, navy, khaki and olive. You can find track pants, warm-up pants and lounge pants all with elastic waists. These pants are ideal for working out or anytime you want to feel relaxed and comfortable. Almost any sporting line features pants with an elastic in their line up. Nike Stretch Woven Pants: These black, elastic waist pants are priced at $70 and are available in sizes small to 2XL. These pants are made with Dri-FIT fabric that will keep you comfortable and dry. Men can enjoy wearing elastic waist pants for a variety of occasions. Whether you want to lounge in comfort at home, go running outdoors or simply enjoy an afternoon with friends, you will be able to find pants with an elastic waist in a style to suit your needs. Keep in mind that most styles of pants with elastic waists are not ideal for professional wear.